What now? Please don't ask for lunch. We're going to hang onto this tiger's tail, which is pulling us in the direction of Napoleon and his Roman obsession. We begin not with the Arc de Triomphe but with another arch half its size. 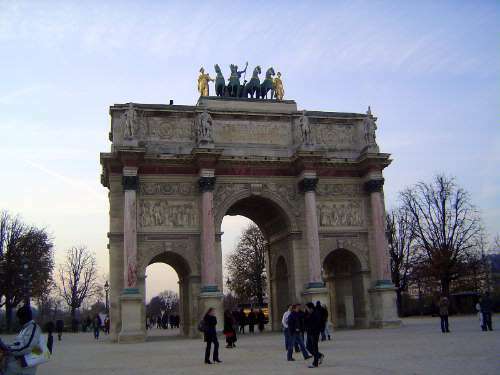 This is the Arc de Carrousel, about three kilometers to the southeast of its bigger sibling. There's a straight line between the two, and it runs southeasterly from the bigger arch and along the Champs Élysées to the Place de la Concorde, then through the Jardin des Tuileries to the Jardin du Carrousel. Behind the camera the axis smacks into the Louvre. Far in the background, almost five kilometers past the Arc de Triomphe, the same axis runs through La Défense, the capital's modern corporate jungle, which (trust me) the tiger will get us to before we're done. The axis is part of the grandiose vision of Andre Le Nôtre, whose conception of landscape architecture had very little to do with flowers. The Arc de Carrousel was built between 1806 and 1808 and like its bigger twin was a product of Napoleon's imperial fetish, no less grand than those of his royal predecessors. The arch is modeled on Rome's Arch of Constantine (or Septimius Severus, according to some authorities, though the differences are small) but is not quite as large. Call it 90 percent of the Roman arch's height and width. The pink marble is a nice touch, the columns themselves having been discovered in a long-abandoned storehouse of Louis XIV. (Can you imagine what "Antiques Roadshow" what have done there? They would have needed ambulances for the infarcted appraisers.) The biggest draw, at least for a few years, was the quadriga up top. These were the horses Napoleon took from St. Mark's in Venice. After his downfall, the Austrians sent the horses home. They were replaced by replicas (as have been the real ones at St. Mark's, taken inside). The Arc de Caroussel seems lost in space, as though it was a prop left over from last week's musical production. It probably did not feel so abandoned before 1871, when the Palace of the Tuileries, which stood just beyond the arch and astride the axis, was burned by rioters with a match. (The shell of the buildings survived for another ten years, but there was enough residual anger that they were then demolished as a reminder of the despised monarchy.) On this side of the arch we're in the Cour Napoleon, most famous now for I.M. 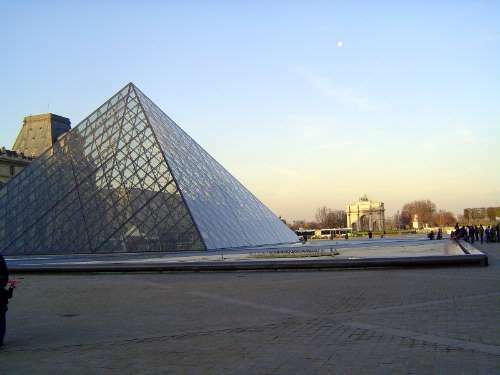 Pei's pyramidal entrance to Frañcois Mitterand's partly subterranean Grand Louvre. The courtyard remains big enough for a North Korean parade. Here's the view the other way. Behind the wing straight ahead, there's another courtyard, much smaller than this one, which is mostly a 19th century blow-up of the older, smaller one. Each wing and each towerish pavillion has a name, which makes things tricky. 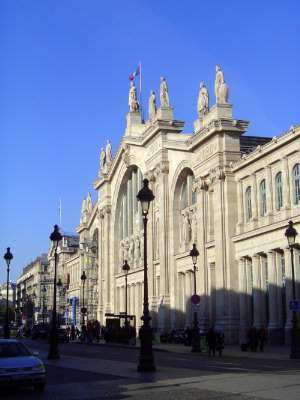 The pavilions on the left, for example, are named Richelieu and Colbert. The one in the distance is Sully; the one on the right, Darli. Want to see the one that started the fad? We have to go through the tunnel under Sully. Here we are, looking back. This is the Pavilion l'Horologe, which takes its name from the clock. On the left is the Lescot Wing, the first one to be built. 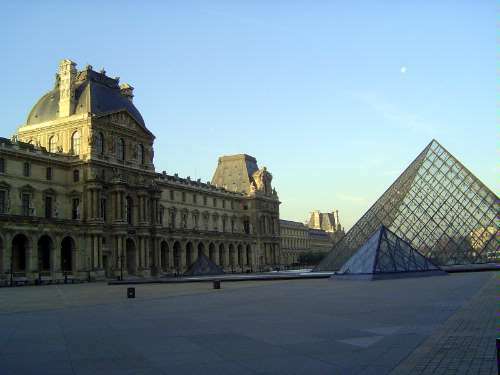 It was completed in 1550 for Henri II, the first king to live in the Louvre. About 40 years later, in 1595, the architect to Henri IV proposed making Lescot's wing merely one wing of a square, the Cour Carrée. Work to do that began under Louis XIII and his architect, Le Mercier. It was Le Mercier who built this Pavillion and the wing to its right, the (surprise!) Le Mercier Wing. Le Mercier was faithful to Lescot, building a wings two stories high, plus an attic under a sloping roof. He kept the arches over the projecting bays, as well as the alternating arches and pediments over the first-floor windows. Both wings still are one room wide, but Le Mercier introduces the pavillion, which contains the escalier d'honneur and divides the wings in half. The giant caryatids are his, too, although you can't help feeling they're a trifle lonely. Maybe the fellow in the man-lift will come up and chat a bit. 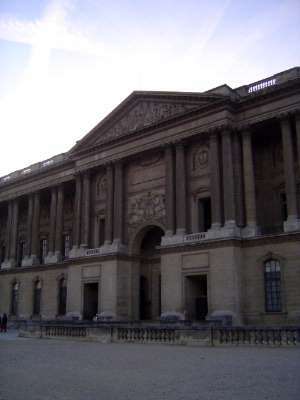 The four wings of the Cour Carrée would not be finished before Napoleon's time. 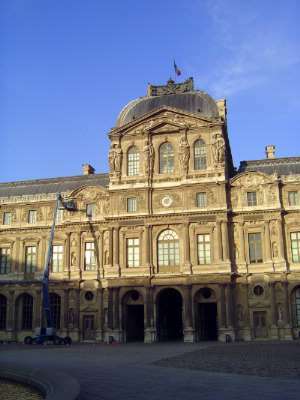 Louis XIV, who much preferred Versailles, did little to move things along except allow work to begin on the east wing of the square. Colbert, Louis XIV's finance minister, appointed three architects to design this side, which was conceived as the entrance to Louis's palace. Because two of the trio worked in a style so different from what emerged, credit is usually given to the third, the amateur architect Claude Perrault. Colbert wrote, "Your majesty knows that next to glorious military feats, nothing speaks so eloquently of princely intellect and grandeur than the affluence of buildings; posterity will always appraise a rule with reference to the buildings erected in his lifetime." 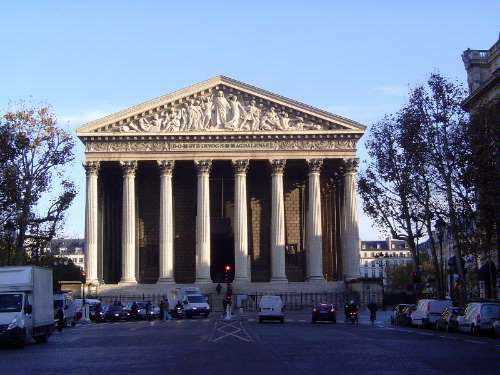 The result, Andrew Ayers writes, became "the summit of French monumental Classicism, a reputation that remains unchallenged today" (The Architecture of Paris, pp. 31-36). 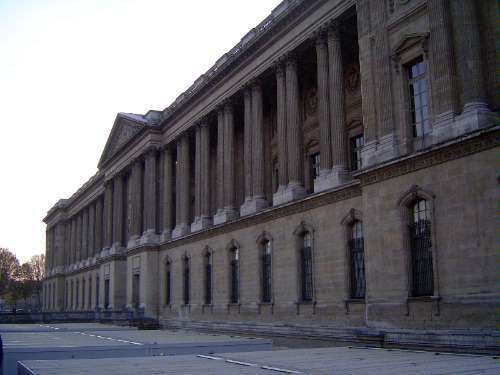 The 600-foot colonnade was completed in Louis's lifetime but not the wing behind it, which remained without a roof for the better part of a century, until Napoleon ordered its completion, along with the other unfinished bits of the Cour. In the interval, Ayers writes, the facade remained "a blind, cardboard-thin backdrop whose chief and only purpose was the representation of royal power. But what a backdrop! Never before had an attempt been made to transpose Roman temple architecture to a palace face of this measure." No need for an attic; instead, just a balustrade. No pilasters, except at the corners; instead, free standing columns, in pairs. Perrault's plans for pavilions at either end were dropped; a moat was built but later filled in. 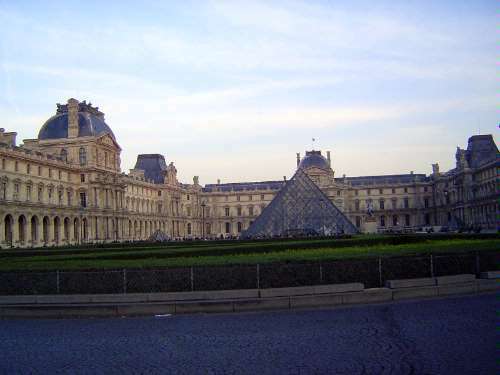 Meanwhile, back on the west side, Henri IV in the 1590s had ordered the construction of a huge wing that would connect the Louvre to the Tuileries, 500 meters away. The shell of that wing, the Grande Galerie, was complete by the time Henri was assassinated in 1608; work stopped until Napoleon fired up the crews once again. Work on the opposing or north wing also began at his order. One of the preliminary tasks was clearing away the housing which filled the space; the work was done by a young Haussmann. (The doomed neighborhood is clearly detailed on the Turgot map of Paris in the 1730s.) Construction in the 19th century came to a peak with the career of Hector-Martin Lefuel, who went to work in 1853 with 3,000 workmen and "transformed the palace beyond recognition." 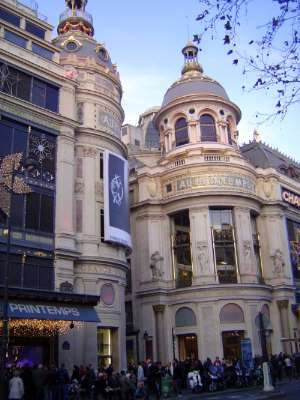 Lefuel created the pavilions seen in the Cour Napoleon. 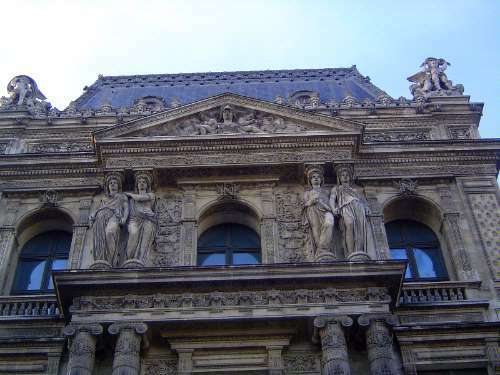 He kept Le Mercier's poor caryatids but "encrusted his facades with luxuriant sculpture" (Genevieve Bresc-Bautier, The Architecture of the Louvre, 1995, p. 128). Ayers calls it "pompously overblown" (p. 38). Enough for the Louvre, where we're likely to be trapped for weeks if we don't escape. We've fled about a kilometer west to the northern edge of the Tuileries Garden. 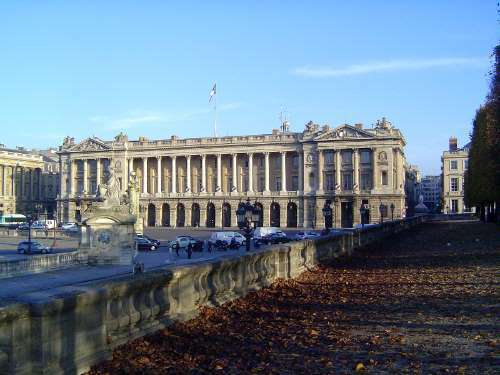 The view shows one of two identical palaces designed by Ange-Jacques Gabriel and completed in 1763 for Louis XV. The one on the west (an edge of it is at the left margin) is now the Hôtel de Crillon. (Don't even think about it: if you're wasting time on this website you're not elegant enough to stay there.) The twin, seen here, was originally Louis' storeroom for palace furnishings (!) but since 1789 has been the headquarters of La Royale, the French Navy. Do you see the hand of Perrault here, a lifetime before Gabriel went to work? That's influence for you. Napoleon loved this stuff. The Church of the Madeleine (Mary Magdelene, that is) was commissioned by Louis XV in 1757. The original plan called for a building like Rome's Pantheon. Thirty years later, and after a revolution, only a foundation and a few columns marked the site. 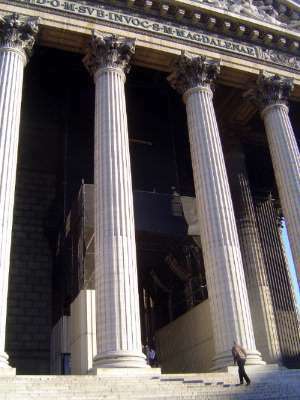 Some months after his great victory at Austerlitz, Napoleon decided to build a Roman-style temple to the glory of his Grand Army. 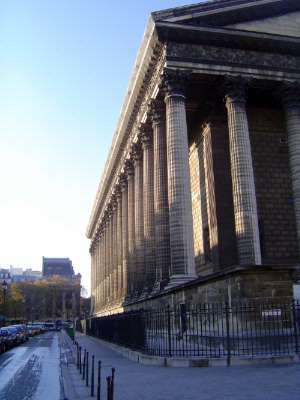 Pierre-Alexandre Vignon began an enormous Corinthian temple on the site. He outlasted the emperor but died in 1828, about 15 years before the church was finished in 1842. It's big, 108 by 43 meters. The Parthenon measures 70 by 30. The columns are proportionally even bigger than those in Athens, because they measure 20 meters, compared to the Parthenon's measly 10. Since the Madeleine was a functioning church, it had to have more interior light than the Parthenon. Faithful to its model, however, it has no windows. Solution: skylights set in low domes. 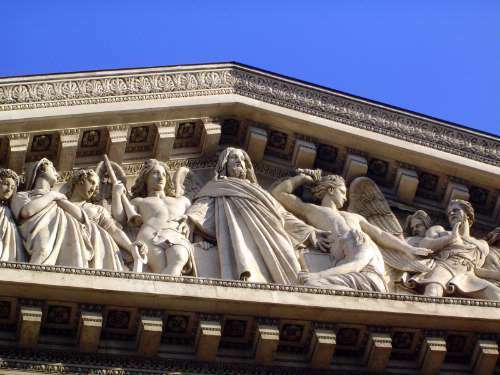 The pediment sculpture, by Philippe Lemaire, shows the Last Judgment. A St. Michael who hasn't been trained to play well with others begins to clobber the damned downhill, while the saved gather on the other side. Bet you can't throw a rock that far. The inscription reads D.O.M. Sub. Invoc. S.M. Magdelenae. If D.O.M. is short for Deo Optimo Maximo, then the phrase means something like God the Best and Greatest, Invoked under St. Mary Magdelene. Can you imagine Samson trying his best to knock this place down? Not even Stallone could do it. The bronze doors were designed by Baron Henri-Joseph-François de Triqueti, who thought it expedient to leave France in 1848 and spend most of the rest of his life in the service of Queen Victoria. 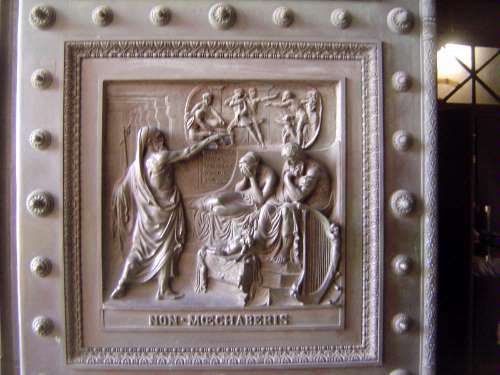 The doors, cast in 1836-7 and installed in 1841, illustrate the Ten Commandments, in this panel the sixth. As recounted in 2 Samuel 12, the prophet Nathan warns David and Bathsheba that their child conceived in sin shall die. The upper right illustrates Nathan's explanation, which takes the form of a story about a rich man who takes the lamb of a poor man to feed a guest. And now for something frivolous. 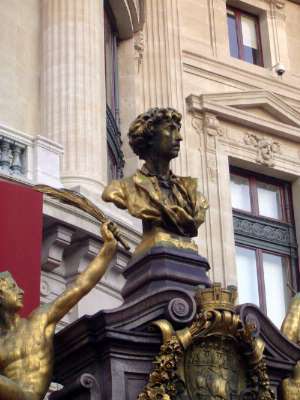 This is the Palais Garnier or Opera, completed in 1875 and built with an iron frame. It has a modern skeleton, in other words, despite all the dressing up with the round pediments of the Lescot Wing and the paired columns from Perrault's east facade. An earlier opera house had been demolished in 1820 after the assassination there of the heir to throne, the Duc de Berry. 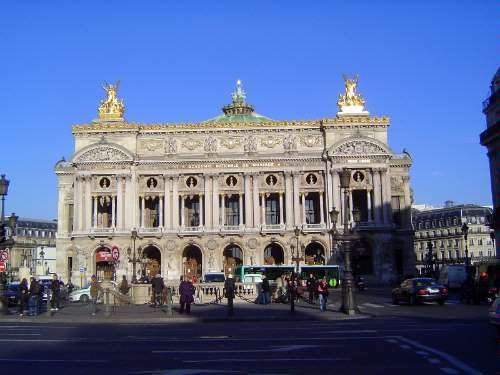 An assassination attempt on Napoleon III in 1858 at another opera house triggered the construction of this one, designed with an eye to security, for example placing the building as an island, without nearby alleys into which an assassin could disappear. The Empress Eugenie anticipated that the architect would be Viollet-le-Duc, master of the Gothic. Instead the competition judges awarded the project to Charles Garnier, who to that point had done only one building. This one would keep him busy for 15 years; afterwards, he virtually retired. Garnier was creating a very social space, one to display, as he wrote, "the movement of the audience and the sort of quivering of a whole crowd, which observes and knows itself observed" (Ayers, p. 175). More than a third of the floor space was for the audience to use, to see and be seen. What have we here? It looks like it wandered in from Gothic Flanders. It is, as Ayers puts it, "a quite spectacular pastiche whose artifice and florid detailing tip it towards the kind of gorgeous kitsch embodied by the castle of Neushwanstein" (p. 92). 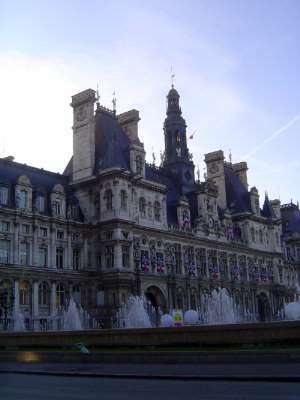 It's the city hall, the Hotel de Ville, and it was completed in 1882, a few years after the Palais Garnier. 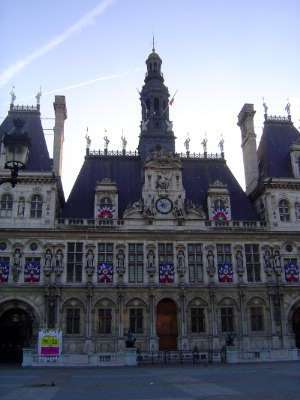 The site had been used by previous city halls since the 14th century, and the last one had been burned down in 1871, like the Tuileries. Again, the old walls had survived but in this case the building was rebuilt much as it had looked before the fire. The large open space in front of it is another Haussmann project. A year before the city hall opened, a former employee of the Bon Marché opened a new department store, Au Printemps. Like the Paris Opera it had an iron frame and was structurally a warehouse and the first store in Paris to be entirely lit by electricity. The cosmetic trimmings, in particular the domes, were demanded by the city so that the building wouldn't look like the warehouse it was. Call it one of the dying gasps of a classicism that would linger on damnably long. Inside there was a courtyard described as a "veritable cathedral in iron," but it was destroyed in the 1960s to make way for a taller building. Classical elements stayed on as ornament long after the innards of buildings had moved into the industrial age. 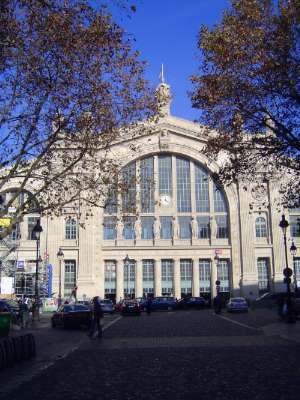 That's the case here, with the Gare du Nord, completed in 1866 to serve the busy Paris-Brussels line. The station was designed by a company architect told to let the building express its function. He did, with a huge gable following the curve of the train shed behind it. Still, it's trimmed with Ionic pilasters and statues personifying European cities.